Good for you. Enjoy your week! Hope you get lots of sleep and feel better! Enjoy your time off Tiffany. Blog breaks are good. Good for you!! I know Katie is looking forward to next weekend, no roommate and no football game ( and hopefully nicer weather than they had last weekend...rain and cold). It's good that you recognize when you need to slow down. These things happen so that you finally do relax. I can relate BIG TIME. For me I need to have a clean house and get all of the errands done before I can completely settle in to do whatever it is to enjoy myself. Everyday I get caught up in what I should do and don't make enough time to do what I want to do. If we just take a little more time to take care of ourselves, I bet we can accomplish more of what makes us happy. i am so happy i stopped by! now i can send you extra reserves of strength, humor, and comfort. i hope you will feel more rested very soon. your newest follower (hope you're following back!). take care of yourself and come all fresh!!!! Amen, sister! My mom used to tell me to "Just breathe. Take things one at a time." Turns out, she was totally right. I find if I just tackle all the things on my to do list one at a time, it's less overwhelming. Hard to remember sometimes though!! 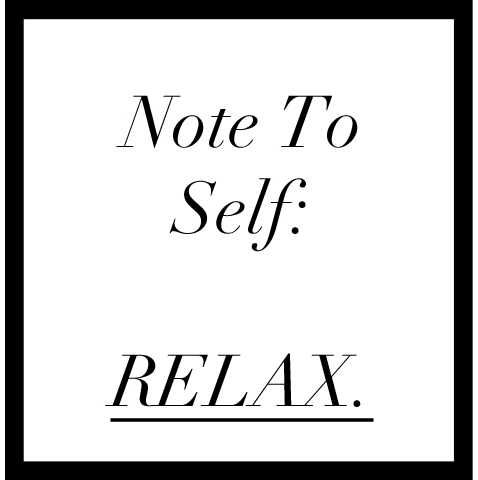 Enjoy the week off from blogland...sometimes, we all really need it! I hope that you feel better! Good for you!! I think I may be taking some time off come October! Enjoy your time away Tiffany! I hope you feel better soon, migraines are so draining. Awwww, I'm so glad for you that you decided to take some time to take care of yourself. The thought has crossed my mind to do the same the past few weeks. Happy you are feeling better now!